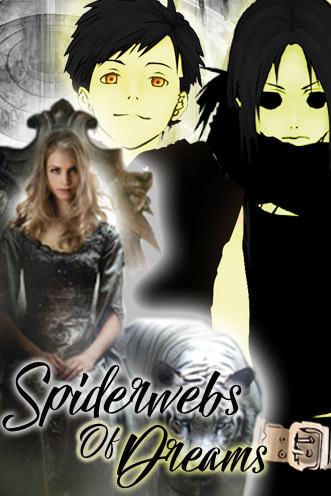 Edward Elric is trapped under his family's fussiness, something at once touching and wearisome. They're being so obnoxious about it that his aunt and uncle made peace with Envy so they could all three join the youngest Elric brother and their honorary sister in keeping vigil over him, dooming him to being stuck on the oversized couch bed in the living room of the brothers' side of the duplex they share with their father and adopted aunt and uncle in Queen, NYC. Honestly, people, just because that transmutation accidentally killed him didn't mean he wasn't just fine. The Gate kept him from truly dying, he had a deal that they needed to start trusting, and now all he feels is tired and like a bruise, this sort of imprisonment is hardly necessary. But that transmutation had another effect besides Edward's brief encounter with death, the energy of it vibrating along the thread that connects the Gate to the abyss, a piece of the Gate's power that sectioned away during the breaking of Order and Chaos; a vibration that attracts the attention of the abyss given form, Dreams Made Flesh. Jaenelle Angelline's appearance in the living room puts most of Edward's family on the defensive over their long-suffering charge, but both Edward and Alphonse talk them down; they could do nothing against the woman who stood in their living room, asking them for help. A help she desperately needs; because while Witch can harness the power of the abyss, necessary to break the power of the Blood that have tainted the Old Ways, Jaenelle's flesh would be burned up in the process. But that thread's vibration sang of someone who survived channeling a deeper and darker power, and that may just be the help she needs. So Witch sought the Gatemaster, the abyss and the Gate reuniting for the first time in millennia. Edward agrees to go to the realm of the Blood, and after Alphonse puts his foot down on everyone else's that their protests are heard and overruled, the family packs up to accompany the boys to the troubled world. They may be thwarted in keeping Edward banished to bed rest, but their irritating fussiness refuses to let either him or Alphonse do anything with the Gate without them there. Envy's even willing to tolerate Hohenheim's presence, if that's what it takes to keep the brothers who fought to give him a family again safe. Because while it may have been the Gatemaster that Witch sought out, it was their Superman and his Kryptonite that was answering the call for help, and their family's foundation rested on the superhero and his strongest weakness. For their own survival, they have to protect the boys from the rain. As Princess Zelda grows, King Rhoam sees a need for her to have her own guard, a special knight to guard and defend her while she focuses on her studies, on awakening the sealing power within her. His captain of the elite royal guard suggests his son, a young man only a year older than the princess, by the name of Link. He's already skilled with the blade, and showed a level of devotion the captain had rarely seen even in his own men when the boy's sister was sick not but a year before. 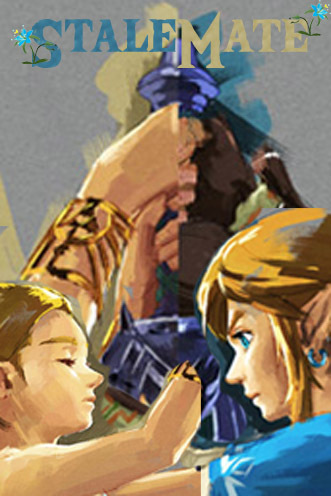 Deciding that the two would make a good match, Zelda needing a companion to the various places of worship she would have to pilgrim to in her studies, and Link needing someone to ground him, Rhoam agrees to assign Link to his daughter. At first, the young teenagers are reluctant to warm up to each other, sticking to their roles and nothing more. But what starts as a working relationship warms to a friendship, and blossoms into a secret romance, that quite frankly, Rhoam approves of. Then the prophecy of Calamity Ganon's imminent return makes Zelda's studies all the more important, and Link's steadfastness becomes the only thing that keeps her from going crazy at her own failures. It soon becomes obvious that Link was meant to be the Hylian Champion in the upcoming battle, and claims the Master Sword to protect his princess with. But while his mastery of the Sword grows, her powers remain locked away, and failure after failure drives a wedge between the two hearts. And it has devastating effects. 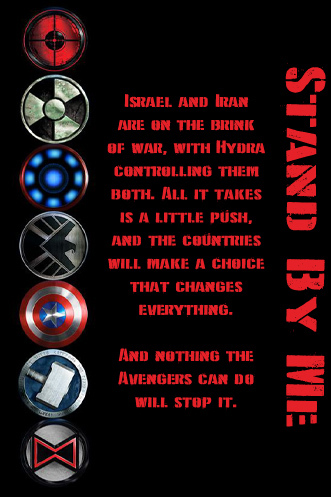 Synopsis: The Avengers are assembled once again, fresh and ready to take on Hydra in the Middle East, specifically sitting on Iran and Israel to keep them from breaking out into official, nukes-thrown-around war. Only, that's not so easy, especially with Hydra controlling both governments. But another Hydra weapon enters the fray, and forces the Avengers to make some choices. Choices that the heads of state in both countries do not like. Choices that lead to the government making choices for the rest of the world. And nothing the Avengers can do can stop it. "Peace is not an accomplishment, it's a responsibility." People who already know emilie_burns or yuuo well, and/or have discussed a desire to watch this blog don't need to say anything. only so we know a bit about who's watching and why.